Land alienation was a major concern for Māori in the early 1900s as its effects took hold of impoverished communities. Te Puea Hērangi was a Waikato woman of mana who, with other leaders, applied herself to the massive task of uplifting these communities – a task made even more onerous because of events such as the worldwide depression of the 1930s. 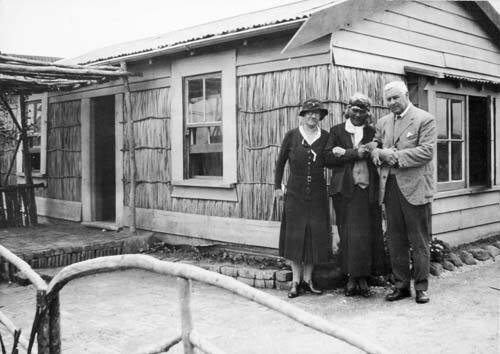 In this photograph, Te Puea (centre) is standing outside a house built within a Māori land development scheme.